The man in the garish robes and discolored wig was applying he last of his makeup when he heard a knock at his door. He scrambled from his seat and nearly tripped over his oversized red shoes as he scurried to the door, cracking it open to peer at the person outside the room. “Cherall…I mean, Dr. Adad? Sorry to bother you, but you have a visitor. She’d like to meet you before your show,” said a lady wearing a headset and holding a large datapad. She glanced impatiently from side to side, tapping her foot. “You know I don’t like visitors, Raha. Especially right before I go live,” he replied with a hint of agitation. “It’s a sponsor’s kid. One of the holders in the Kor-Azor family. She’ll only be a minute,” Raha whispered. Cherall looked down and saw blond curls peek through the door’s frame a full meter below his producer’s face. He sighed softly before nodding his head and opening the door more fully. The little girl looked up at Cherall with wide, green eyes as she stepped into the room. Cherall closed the door and smiled at her. The wide, red grin painted on his face accentuated his expression, and the nanite-infused compound on his cheeks glowed softly as various shapes illuminated around his cheekbones, spinning and bulging across his face. The little girl giggled at the sight, holding her hands in front of her mouth out of politeness. “What’s your name, little one?” Cherall inquired, sitting down in his makeup chair gingerly, his knees cracking with the exertion. “Fimiris,” she whispered through her hands, still staring at Cherall. “Are you a fan of the show?” Cherall opened a drawer at his desk, rummaging through its contents. “No, not at all. He finds it rather amusing, as do I.” The girl waved back and forth lightly on her heels as she talked. As the little girl left the room, Cherall glanced to a sign posted above the dressing room’s door. It was a simple wooden placard with blocky letters burned into it. The sign contained a short passage from the Book of Reclaiming: “Lead all children to the light of God, for Heaven is theirs to inherit.” Cherall stared at the inscription, deep in thought. After a few moments, his meditation was broken by the buzzing of a datapad on his desk. Throughout the room, dozens of lights flashed on and hundreds of children’s faces appeared throughout the empty space, filling the area from ground to ceiling with holographic projections of smiling children clapping their hands to the upbeat music reverberating in the room’s atmosphere. The children’s images flickered as they clapped their hands in time to the music. After a few minutes, the clapping turned into full applause as Cherall entered the room, running onto a lighted stage and performing cartwheels and somersaults across its width. Camera drones followed his routine from multiple angles as he flitted around the stage and spun wildly into the air. 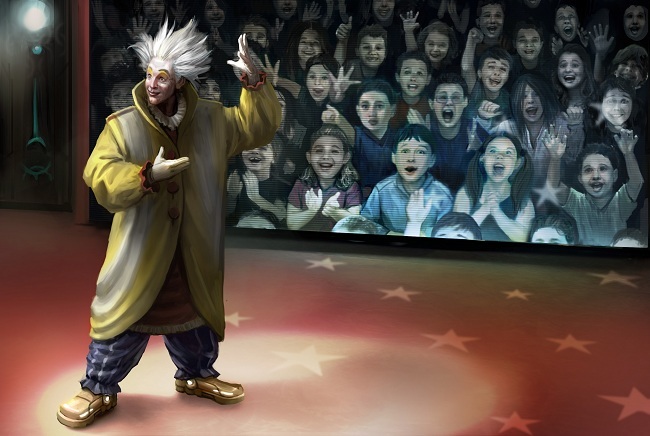 The music throbbed louder and the children’s applause intensified as Cherall completed his gymnastic barrage by launching himself in the air with the help of his gravboots – and floating back down to the stage floor with eight consecutive rolls in the air. He landed softly, raised his arms, and the music stopped. The children burst into applause all around him, their images flickering more intensely. “Hello, children. I’m Dr. Adad, and welcome to my Wild Time!” Cherall bellowed to his audience, who applauded wildly in response. Cherall hushed them with a wave of his hand. “We have a very special show to you today, as we are filming this live from our studios on Nakregde II.” More applause ensued. Cherall’s painted face retained a solemn expression as he bowed his head. Inside the room, hundreds of holographic faces followed suit. Across the cluster, millions more children bowed their head in prayer as they watched this live feed, their parents smiling with bemusement. Cherall tilted his head up and looked into the nearest camera drone. The audience burst into applause and many children whooped and hollered in delight. A smile slowly crept upon his face. On the vidscreens across the Empire, children laughed aloud as his cheeks flared with glowing numbers, letters, and symbols, the glyphs morphing and moving along to a bossa nova rhythm that had emerged in the background. Cherall’s eyes followed the glowing symbols as best they could, crossing and uncrossing, twirling and darting inside his sockets. The clown’s smile intensified as the camera drone focused deeper onto his face. The glowing symbols changed colors and swirled together, forming more complex images and figures. As the theme song continued its rampant rhythm, a person emerged among the glowing shapes: a tall Minmatar man, dressed in plain clothes and covered in tattoos. Two more figures emerged shortly afterward. One figure was that of a shorter Amarr man in elegant robes and pale skin. The other was a large, anthropomorphic furrier standing on its hind legs and wearing a dress. A title in big, animated letters zoomed over the heads of these characters: “The Adventures of Mr. Wayward and Friends,” followed by the subtitle, “Today’s Adventure: The Thief among Us.” Off camera, the children exploded into applause. Cherall stared in disbelief at the woman projected onto the vidscreen. Tears were streaming down her face and her auburn hair was hanging in front of her face in tangles. Cherall cleared his throat. Her ex-husband nodded his head and waved goodbye as he severed the call. The nanites shifted into place, forming the words “The End.” The camera drone zoomed out to show Cherall’s eyes rolling around and around inside his eye sockets, feigning dizziness. The children again clapped and cheered as the camera continued to zoom out. When Cherall saw his full image again showing on the vidscreen monitors around the stage, he lunged backward into a complete triple back flip, and landed on one hand. Spinning in place, he twirled once more into the air before landing on his feet and smiling to the camera. Cherall twirled in place, his body twisting violently as it gained momentum. He pirouetted in a constant motion and propelled his body across the stage, continuously spinning as he progressed in a figure eight. As he performed his signature “Spindlemas” dance to the children’s delight, a woman appeared at the other end of the stage. She was dressed in a long, white, flowing dress with a white parasol in her hand. Bright red flowers adorned her hair, and brilliant colors flashed across her dress as she tiptoed around the spinning clown. The children laughed and clapped as she followed Cherall’s gyrating form, attempting to catch up with him. Finally, Cherall spun in place for several seconds, allowing the woman to sidle up to him. She stood on her tiptoes and extended her arm out, putting on finger at the crown of Cherall’s multicolored head. Instantly, he stopped spinning and beamed at the audience in shock. He turned to the woman and gasped. “Miss Melody, I can’t believe it’s you!” he exclaimed. The audience applauded as Miss Melody curtsied again. “We can’t wait. Without further ado, take it away, Miss Melody.” Cherall bowed to her, then ran backstage as the first notes reverberated throughout the hall and Miss Melody’s pristine soprano lilted through the air. When he reached backstage, Cherall found the nearest available chair and sank into it. He closed his eyes and took deep breath. He became lost in the song’s beautiful melody. As he sat there, listening to the music, he cried softly to himself. “Yes, I did,” Cherall replied. “Well?” Tadama had bags around her eyes from lack of sleep. Her pupils were dilated and she had trouble focusing on the image in front of her. She drummed her fingers on the data console in ragged strokes. Tadama glared at his image on the vidscreen. She grabbed the nearest object to her – an urn – and threw it against the wall. “What do you mean you don’t know?” she screamed. Tadama gasped. She looked around the room in bewilderment. “What? When? How?” she stammered. “Why haven’t I heard anything about this yet?” Tadama asked, her voice quivering. “We’ve kept it quiet. We didn’t know what to do. The Theology Council has officially endorsed our show for the edification of the faith. We couldn’t cancel the show without explaining it to the Council.” Cherall sat down again with a heavy sigh. Across the vidscreen, Tadama followed suit. Cherall remained silent, his head bowed in prayer. At the end of the program, Cherall stood in the center of the stage, a single spotlight shining down upon him. He smiled to the camera drones. In turn, the children bowed their heads. In the air surrounding his body were the images of hundreds of devout faces peering at the ground or with eyes squeezed shut, their hands folded in front of their faces, and their lips moving softly and silently. Cherall followed suit. The children raised their heads and stared at Cherall. Cherall, in turn, raised his head as well. As the children applauded for the final time that evening, Cherall looked around at all the faces surrounding him, the hundreds of visages floating in the air inside the room, staring down at him and smiling. A single tear rolled down his cheek as he continued to look at them, searching hopelessly for something familiar among all the innocent faces.